Contact your friendly Abberley charter broker for assistance in planning an ideal yachting vacation in Olbia, Sardinia and Corsica. Olbia is Sardinia’s biggest town and also hosts its airport and port. While many view it as a transit town – and some are put off by the vast number of ferry boats and aircrafts arriving and leaving – it offers a number of sights worth visiting. 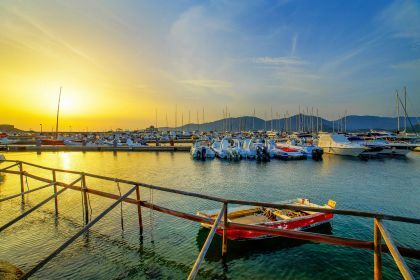 Olbia’s most appealing attractions include a couple of beautiful old churches and an archaeological museum. Its historic port, used since pre-Roman times, was in this area, but the main ferry port is now located on an island in the bay. Olbia’s centre is based around the Corso Umberto, a busy shop-lined street leading uphill from the waterfront. It opens into the Piazza Margherita at the top of a small hill. Several pretty narrow lanes lined with old stone buildings fan out from here, leading to Piazza Margherita and Piazza Matteotti. Just off Corso Umberto, you can visit the Chiesa di San Paolo, a beautiful church built on the site of an ancient temple. Olbia’s other significant church is just outside the heart of town, a short walk beyond Via Mameli. The Basilica minore di San Simplicio is a Romanesque granite church dating back to the eleventh century. Other spots worth seeing as you stroll around Olbia are the town’s market square, Piazza Mercato, and traces of Olbia’s ancient past: a stretch of the town’s Punic walls, in a housing area between Via Aquedotto and Via Torino, and a stretch of ancient paving outside the town hall at the harbour end of Corso Umberto. Some of Sardinia’s best eateries are also found here, boasting the freshest seafood as well as meat dishes, for which Sardinia is famous. Typical Sardinian food can include anything from procceddu, grilled pork served with myrtle leaves on a large tray, lobster Catalan style and pasta with hand-made sauces created according to ancient recipes. The local wines, such as 2007 Agricola Punica Montessu Isola dei Nuraghi IGT, are also celebrated. Recommended eateries include the highly rated Agriturismo Agrisole (vegetarian menu is available), Il Mattacchione, Agriturismo Stazzu Li Paladini and Pizzeria Dadino. All serve fine Italian and Mediterranean cuisine. And when it’s time to kick back and enjoy the peace and tranquility, some lovely beaches for idyllic beach hopping include Costa Corallina Beach, with its white sand, clear water and interesting rock formations; Isola Rossa – great for snorkeling; Spiaggia Pittulongu - La Playa, with its two restaurants conveniently close by, and Porto Istana Beach, which offers a sublime view from the beach to Isola Tavolara. 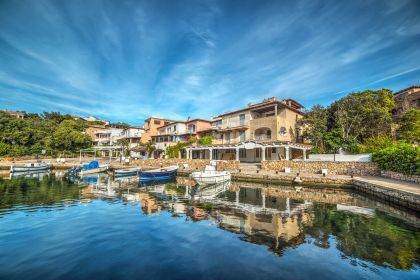 Sardinia is a strong draw card for any sailing holiday, offering natural wonders, fascinating antiquities, a vibrant nightlife, high-end shopping, and so much more. Sardinia is a delightfully alluring island, and is a convenient stone’s throw away from Corsica. It’ll only take a couple of hours by yacht to get from Porto Cervo to Porto Vecchio, and even less time to reach Bonifacio. And these towns are worthy of a visit.